Burning less gas in city traffic all week equals more gas for long drives to trailheads on the weekend. How I’ve been scrimping on gas consumption: minding my tachometer, and trying to make sure my engine never spins faster than 2000 revolutions per minute while in town. Stop-and-go driving is fiery death to fuel economy. It’s basic physics: it takes far more energy to get 3000 pounds of steel moving from a dead stop than it does to keep it moving because the car’s momentum helps keep the car in motion. A car’s engine generates motive power by spinning; the fewer times it spins, the less gas it burns. Easing the beast up to urban speeds has got to be more economical than kicking the throttle wide open. When a light turns green I prefer to hit the gas, sending the engine racing to 3500 or 4000 RPM. A couple weeks back I wondered what would happen if I just picked an even number like, say, 2000 RPM, as my engine speed limit. On flat ground (sorry, San Franciscans) in midday urban traffic, it’s going fine. I do get away from stop lights a bit more slowly but not nearly as much as you’d think, considering the engine’s running 30 percent slower. Once I’m up to speed around 35-40 mph, I find the car runs fine around 1,800. But is it saving gas? Well, I can’t believe my nine-mile round trip to work five days a week is saving that much gas, but I figure at $4 a gallon, it all adds up. My most recent fill-up went to 22 mpg from 20 in the previous tank, but I might’ve done better because I left the air conditioning off most of the week. On the freeway you have to go fast to stay alive. I can’t rev the engine under 2,500 without risking getting pancaked by Hummer-driving venture capitalists. But the lack of stop-and-go on freeways (rush hour excluded) more than makes up for the extra RPM. In town, stop-and-go is unavoidable, but I do think you can ease some of the gas strain by easing back on the throttle when pulling away from a stop. All that matters is using less gas; 2,000 RPM is an arbitrary number, but it does offer easy-to-remember way to dial back on gas-guzzling driving habits. (This is a bit trickier if your car’s got no tachometer but engine noise is a rough guide to speed. The quieter the better). 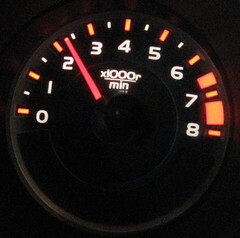 Subscribe to comments with RSS or TrackBack to 'Improving gas mileage: the 2000 RPM challenge'. I have always heard that this with proper tire inflation, really lowers your gas mileage. I think you mean raise you gas mileage. I recently started doing the same thing when gas hit $4 a gallon. I am able to get 24 mpg in my Subaru Outback when it’s fully loaded on camping trips including a roof top cargo carrier. Read your cars handbook or online. This will advise you of the best RPM for torque of your motor . Fit a vacuum guage this will show when the motor is at peak efficency.